APE introduces the Pro Series manual cam chain tensioner. This new tensioner is designed for the racer who frequently adjusts his engine. The easy-access socket head adjuster screw is perfect for tight spaces. The interior o-ring design ensures that repeated adjustments will not eventually flatten the o-ring against a jam nut. 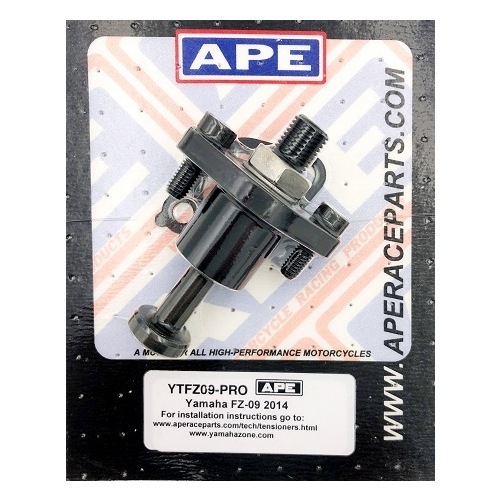 APE'S Pro Series tensioner features an internal o-ring and custom-machined adjuster bolt. The bolt is broached with a 4mm hex. Most Pro Series tensioners come with mounting bolts and gasket (or o-ring, where applicable). CAUTION: INCORRECT INSTALLATION OF A MANUAL CAM CHAIN TENSIONER MAY RESULT IN SEVERE ENGINE DAMAGE. IF YOU ARE NOT CERTAIN HOW TO INSTALL THE CAM CHAIN TENSIONER THEN IT IS ADVISED THAT IT BE INSTALLED BY A SHOP WHO IS FAMILIAR WITH THIS PROCESS. IMPORTANT: WHEN REPLACING ANY HYDRAULIC OEM TENSIONER WITH A MANUAL TENSIONER, IT IS IMPORTANT TO MAKE SURE THAT THE OIL PASSAGE THAT SUPPLIED THE OEM TENSIONER IS BLOCKED OFF. FAILURE TO DO SO COULD RESULT IN A LOW OIL PRESSURE SITUATION. DO NOT over-tighten the cam chain, as cam chain giude damage could occur. Be sure jam nut is tight against the tensioner body when complete. Link to a YouTube video of an APE tensioner being installed in a 2009 Yamaha R1 here. Step-by-step installation on a GSXR SRAD motor in this forum - here. Step-by-step installation on a Honda CRF450 here. Step-by-step installation into a 2014 Yamaha FZ-09 here. A no-stone-left-unturned installation of the APE Pro Series tensioner into a 2005 GSXR1000. Very detailed and cool video here.